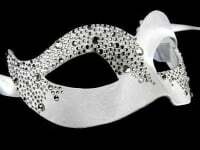 Real Venetian, The Spellbound Mask - Swarovski Edition - will bedazzle. Choose the Spellbound for your next themed party, masquerade ball or special occasion. This luxury Masquerade Mask is a piece of Venetian artistry in metal filigree lace and real Swarovski crystal. The Spellbound sparkles with colour among the intricate black filigree lace - ruby red, emerald green, sapphire blue, gentle amber, rose pink and royal purple. The design may be centuries old yet the quality is timeless Italian - to thrill even the most discerning of masquerade and fancy dress partygoers. Treat yourself to the Spellbound masquerade mask and step out to your party in style. Like all our masks, the Spellbound comes direct from the makers in Venice with a Certificate of Authenticity. Venice’s mask makers (or Mascherari) are a symbol of the city’s history and culture. They perfect their work in tiny workshops, hidden in the narrow alleyways alongside the canals characteristic of this northern Italian city. When Carnival season comes, every year for the two weeks until Shrove Tuesday, Venice comes alive with the extravagance of the masquerade costume. Carnival goers travel from all corners of the globe to see, and be seen at, the world famous Carnevale di Venezia. And where did it all begin? The first masks were worn in the 12th century to conceal identity and to allow the wearer to become temporarily free from Venetian society’s restrictions. The mask (and its accompanying costume) would allow its wearer to move incognito around the city’s narrow passageways and canals. Today, you can bring some of the grandeur of Venice’s masquerade balls to your own masked party or themed event, wearing the Spellbound filigree mask, or another genuine Venetian mask from our collection. Satin ties of red, gold, pink and blue make the mask a perfect fit to the contours of your face. Delivered free to your doorstep, why not order your genuine Venetian mask today?